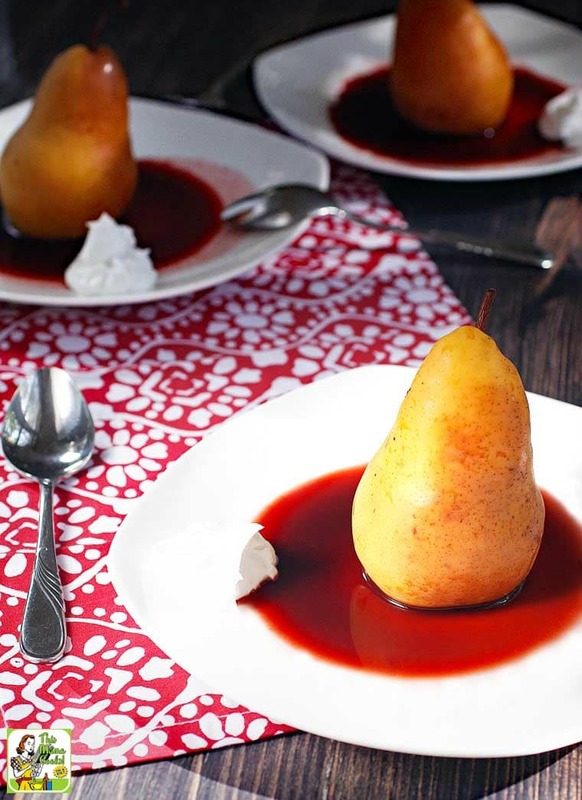 Slow Cooker Poached Pears is an elegant, easy to put together dessert for Valentine’s Day. To make this poached pears recipe easy to cook up, I opted to use a slow cooker. This way you can have your poached pears cooking away (and ready - yesssss!) while you’re making your Valentine’s Day dinner. With proper planning and timing, you can turn off your slow cooker and the poached pears will stay warm until it’s time to plate and serve. 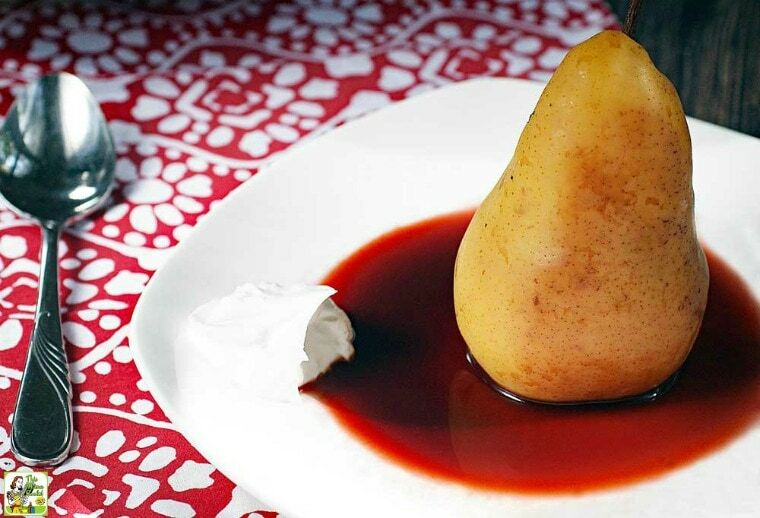 Poached pears in wine is what most of us are used to when we think of a poached pear dish. The pears are cooked up on the stovetop in a red wine and sugar mixture. Delicious if you’re not watching your waistline or if this is an adult-only indulgence. However, this Slow Cooker Poached Pears recipe is for those who want something a little more wholesome. 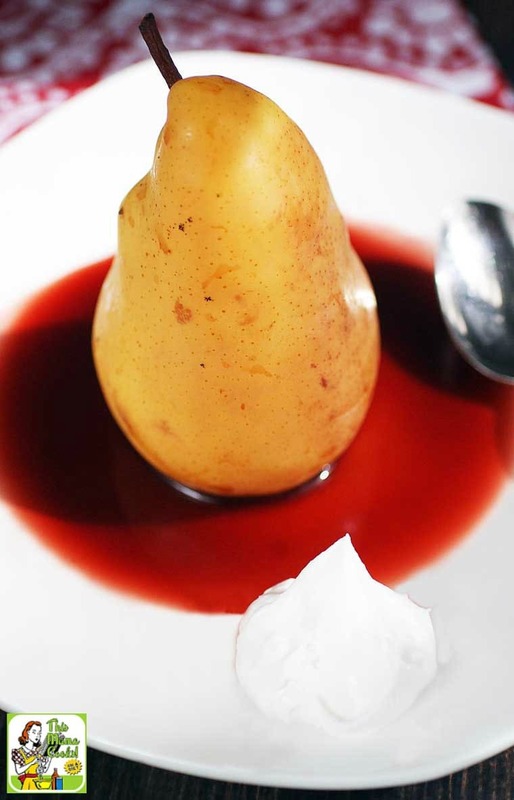 Maybe you want to share this poached pears dessert with your kids or with friends who don’t drink. 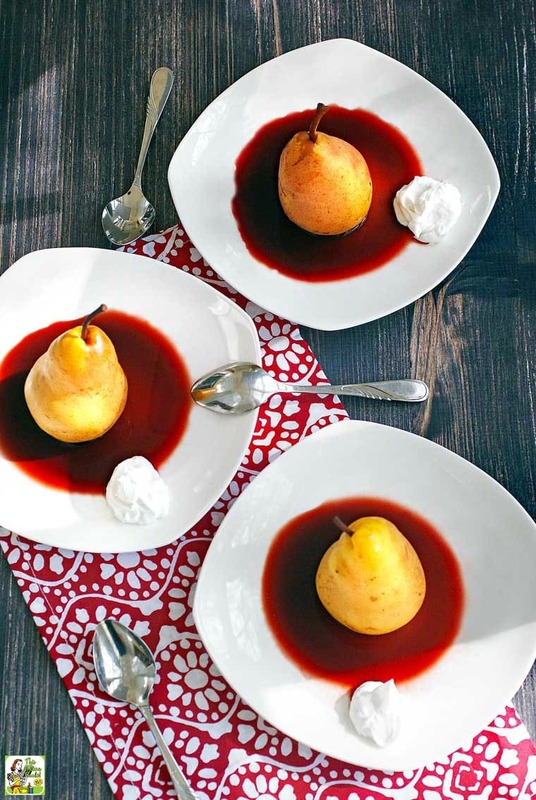 That’s why these poached pears are cooked in unsweetened cherry juice and sweeten naturally with orange juice and no-calorie monk fruit sweetener. The benefits? Cherry juice is rich in Vitamin A and C. There are studies stating that cherry juice supports better sleep and may relieve symptoms of arthritis and gout. Plus, it's delicious! In addition, Slow Cooker Poached Pears are dairy free and vegan. That’s because I’ve used coconut cream (sweetened with monk fruit sweetener) instead of whipped cream. What are the best cooking pears? Pears are an excellent source of fiber and full of Vitamin C with only 100 calories per serving. Did you know that up to 10 varieties of pears may be available at your grocery store? A bit confusing when you're trying to pick out one to cook with! David Lebovitz feels that Bosc or Seckel pears are the best for poaching. You should pick a crisp or slightly under-ripe pear for poaching. So how do you tell if the pears at the store are ripe or not? I have a tough time because pears always seem rock hard to me! Then when I let them sit in the refrigerator too long, they end up getting too soft and mushy. YUCKO! To find out if a pear is ripe, just apply gentle pressure to the narrow neck of the pear with your thumb. If it yields to pressure, it's ripe and ready to eat. But remember, a ripe pear is too far gone for poaching. Pick one that's not ripe yet. Coconut cream is thicker than coconut milk because it contains less water. Some brands may contain thickeners like xanthan gum, which is fine to use in this poached pears recipe. But stay away from any brands with sugar. Those types of coconut cream are usually meant for making pina coladas and won’t whip up. You won’t get as much cream as a full can of coconut cream, so use less monk fruit sweetener. Place can of unsweetened coconut cream in refrigerator overnight. About 15 minutes before plating, place bowl and wire whip beater from your stand mixer in refrigerator for to chill. Prepare the coconut whipped cream by spooning the chilled coconut cream into the chilled bowl. Add monk fruit. Whip on medium high like you would whipping cream until it’s light and fluffy and soft peaks form. Do not overbeat. 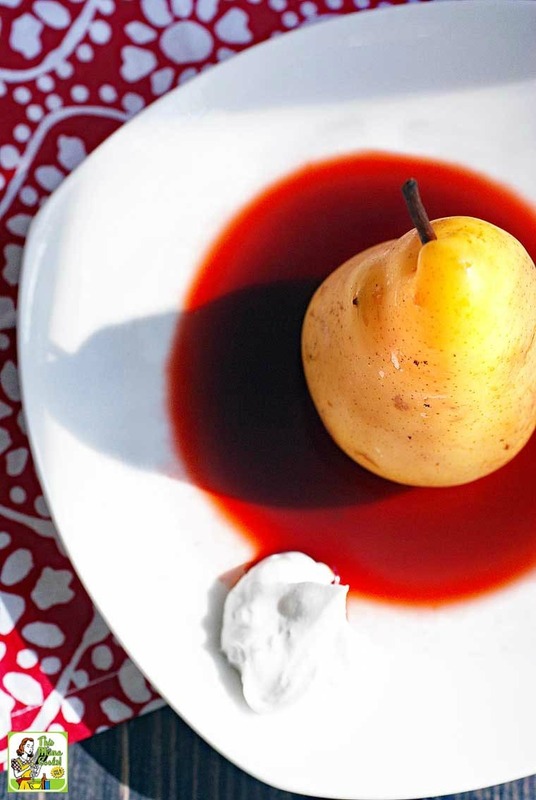 Store whipped coconut cream in refrigerator until it is time to plate poached pears. Remove cores from bottom end of pears, leaving stem end intact. Slice the bottom of each pear so it sits flat. Place cherry juice, orange juice, cloves, cinnamon, vanilla bean and Monk Fruit in the Raw in an oval 6-quart slow cooker. Stir until monk fruit dissolves. Set pears in cherry juice mixture sideways so the juice gets into the core. Cover and cook on HIGH for 90 minutes. Flip to the other side so they cook and color evenly. Cook on HIGH another 90 minutes until pears are tender. Turn off heat. Using a soup ladle, remove half the liquid from the crock. (Place cover back on slow cooker to keep pears warm.) Pour cooking liquid into a sieve over a medium saucepan. Discard any solids. Bring liquid to a boil over medium high heat. Lower heat so it remains at a fast simmer but doesn’t boil over. Boil cooking liquid for about 20 minutes or until it has significantly reduced and starts to thicken. Suggested plating: Pour thickened cooking liquid directly on plate. Place pear on top, sitting on its leveled bottom. Then place a generous dollop of whipped coconut cream on the side. Originally published on November 5, 2014. Updated with new pictures and information.